Guard(### Stamina) Guards Against a Technique that deals ###x2 Base Damage. *Soul Flame Blast (250 Chakra) 400 Life/Stamina/Chakra Damage, Opponent cannot revive if this is the Killing technique. Inevitable,Once per Battle.Line-Range:Same as Soul Dragon. 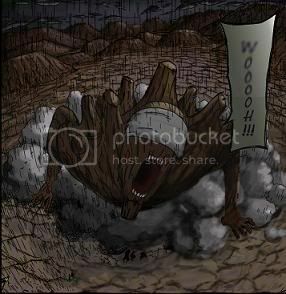 Tailed Beast Weapon:Hell Stone Bomb (All Nine Bijuu) The Targeted Area on the World Map will be completely Destroyed. All Villages,Players,Unique Items will be Destroyed and Reported to the Death Thread. Akatsuki will gain all rewards. Demons are scattered after Technique is used. Once per Collection of all 9 Demons. Bond of Chakra Receptors (300 Chakra) The King of Hell can now use any Skill that the User possesses;User and Summon cannot move.The Hell Statue can transfers its chakra to the User.Once per battle.